Mother’s Day is very quickly approaching and if you haven’t already bought your mom something, here are a few last-minute ideas for gifts, all under $75! 1. Chloé Perfume– This classic perfume could be a great signature scent for your mom! 2. Anthropologie Bundled Drops– These dainty blue earrings would be great to wear to a special occasion or to dress up a casual outfit. 3. Privet House at Target Chalkboard Name Tags– Perfect for the mother who loves to host dinner parties. 4. Forever 21 Striped Scarf– Stripes are always a classic pattern and the yellow hue of this scarf makes it perfect for summer! 5. Michael Michael Kors Leather Card Holder– A chic little case for your mom to store her own business cards or those of others. 6. Origins Stress Diffusing Candle– The calm and soothing scent of this candle is sure to please your mother! 7. Dinner Date– Surprise your mom with dinner at her favorite restaurant or even cook for her yourself! 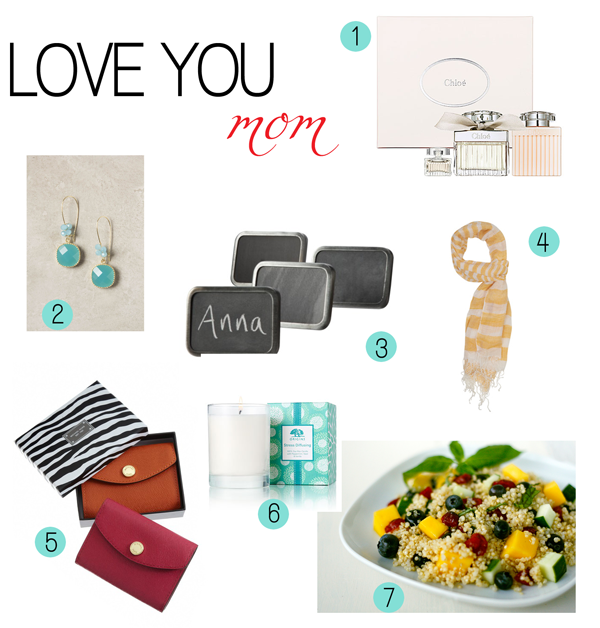 Tell me: What did you get your mom for Mother’s Day?